“Size matters not. Look at me. Judge me by my size, do you? 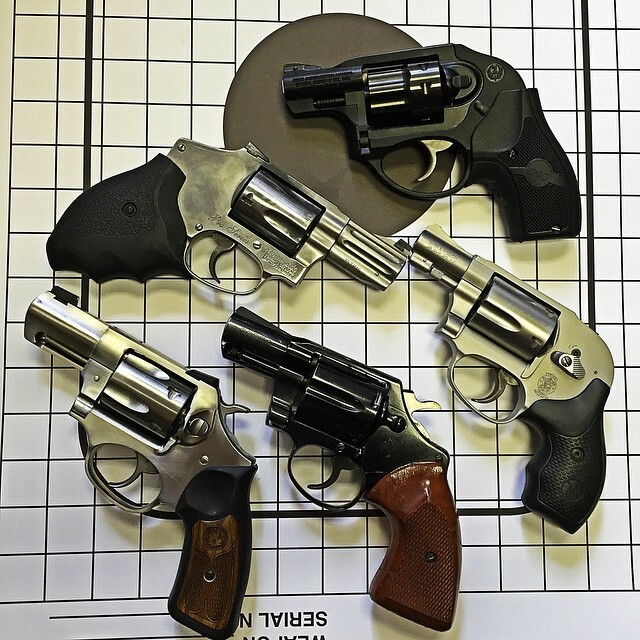 And well you should not.” From top to bottom: Ruger LCR-22 with Crimson Trace grips, used mostly for NPE and as a kit gun; Smith & Wesson 640 Pro Series .357 Magnum with Ergo Deltagrip, used as EDC pretty regularly; Smith & Wesson 638 Airweight .38 Special, just purchased and will likely be used as a BUG and for NPE; Ruger SP101 .357 Magnum Wiley Clapp, EDC; and last but not least a genuine Colt Cobra .38 Special, used for when I want to feel like Bud White. Victory Motel shootout: one of the best movie gunfights ever committed to film! My favorite is a SW mdl 19 short barrel .357. I would stake my life on this little sweetie. Those guns have wee tiny stocks on them, if I were I might change the grips for something larger. Those little Cobras are great shooters. And, they hold 6, unlike the little Smiths. My only negative observation is that I have seen 148 HBWCs tumble out of them. Never liked the Colt cylinder release; they’re such beautiful guns (the ones made before the strike) and it seems like a shame that the first motion of the reload absolutely requires two hands. Stands for “Non-permissive environment” which is shorthand for a place where if you’re caught carrying there could be serious repercussions. The most common NPE for my readers is their workplace, where carry is forbidden by company policy. NPE. Aha. Like Illinois. I completely understand. How do you like the Delta Ergo Grips? Been meaning to order a set for my 642. They seem to make a lot of sense, though I expect they’ll protrude from the top of my cargo pocket (carried inside a PCS “No See Um”). Still it looks like a really good shooting grip.